Failures and shortcomings of government are the most significant factors behind the bitter reality that children with disabilities in Israel do not get the care they need. A startling report issued a short time ago by the State Comptroller (Ombudsman) on paramedical therapies for children with special needs in Israel articulates a depressingly long list of obstacles, deficiencies and outright failures. This is alarming given that the international Convention on the Rights of the Child (to which Israel is a signatory) requires the State of Israel to grant each child, and those responsible for his/her care, the appropriate assistance as required by his/her personal and specific situation. Lengthy delays: The State Comptroller’s investigators reported waiting times of a year and more in order for a child to receive therapies. Waiting times of many months are experienced by families seeking to get an evaluation. The reality of lengthy waiting times is often devastating to the development of a young child with special needs. Chaos: The investigators found an overwhelming number of separate service providers including health maintenance organizations (HMOs – called Kupot Holim in Hebrew), the Ministry of Health, the Ministry of Education, hospitals, local government authorities as well as a range of NGOs – non-profit organisations with a striking lack, meaning absence, of any entity to provide coordination and/or oversight. Each of these service providers operates in accordance with its own home-made rules and procedures. The predictable result is incoherence in relation to criteria for eligibility to receive treatments, and unjustified rejection of reasonable requests for therapies in circumstances where the child may (or might not) have received service from one or another of the other service providers. An example of the chaos: Children in day care centers are frequently told by the family’s HMO/Kupa that their request for therapy is rejected on the grounds that the children received them at the day care center. (This as a matter of fact is often untrue – day care centers are often ill-equipped to provide the services which the Kupa claims they delivered.) Moreover no one (for instance, not the Ministry of Health) supervises to ensure that the child does in fact receive therapies. Or ensures that the therapies meet any relevant standards. The result, far too often, is children simply miss out on essential therapies or – as the report concludes – suffer developmental harm by getting therapies that fail to match up with their personal and specific needs. More chaos: The Kupot too often flatly refuse to authorize (i.e. pay for) therapies for children who are enrolled in the Special Education frameworks. This includes refusing to authorize therapies that are listed in the Ministry of Health’s “Basket of Services” that the Kupot are obliged by law and contract to provide. And that in many cases they claim to provide even though in reality they do not. Adding to the hardship, the Kupot exhibit a strong preference to refer children with special needs to the in-house child development centers operated under the Kupa’s own auspices. They do this instead of approving treatments in hospitals or other centers which may be more convenient or more suitable for the child and the child’s family. Six child development centers have been shut down by the Kupot since 2009, most of them in periphery communities. The decision to close them is made with no regard for the enormous negative impact this has on access to services. Though the law specifies that, to the extent possible, children with what are termed complicated development issues should receive all their treatment under a single roof for obvious reasons relating to the burden on the family. In reality, the Kupot frequently require the families to attend multiple centers and clinics in order to receive the treatments to which the child is entitled. Breaching the law: As a result of these serious failures of performance and of policy, children with special needs are frequently not getting the therapies to which they are entitled under the law and which are essential to their well-being and development. Misallocation of funds: The Ministry of Health does not allocate a budget for therapy hours in special education day-care centers to the local authorities. So the local authorities in turn don’t allocate a therapies-specific budget to those special ed day-care centers. The result is that portion of the overall budget allocated from the local authority to the centers which is supposed in some general way to be applied to therapies for special-needs children ends up being channeled to other uses such as teaching hours. So what happens to the needs of the children who were supposed to receive funded care? A good question. You can probably guess the answer. No supervision: The report cites a complete failure of supervision among service providers. The result is that it is unknown whether therapies are given, and if they are, to what standard. 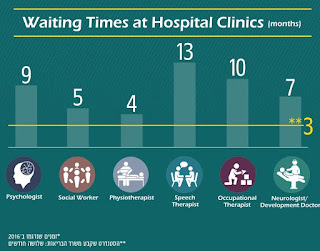 Inadequate staffing levels: The report refers to a general shortage of professional staff throughout the country and especially in Israel’s south, and makes clear that no remedial plan for future improvements exists. Here at the Malki Foundation, we are only too well aware of the deficiencies in the system. In fact, our work was designed from day one to deal with them and to provide bypass-road solutions to the families who are the system’s principal victims. It’s gratifying to see a government figure investigate them, report on them and place them in the public space for reasoned discussion and – care we hope? – remediation. We raise money from supporters to fund the therapies that children with disabilities are entitled to by law but are not receiving because of the shortcomings described by the Ombudsman. We do it with great care, and with checks and balances that we can describe another time. Now in our 17th year of operation, we can say with confidence the approach we adopted works. In fact, the families who benefit have told us it works really well. We sincerely hope this report will shine a bright light on the problem and spur the agencies involved to significantly improve the way they provide services. Only then will children with disabilities in Israel be able to reach their potential and have the quality of life they and their families deserve.